Digital Genesis charts the evolution of computing and the rise of artificial intelligence. From cloud AI services and autonomous robots, to 3D printers and quantum processors, the book details the latest digital technologies and predicts their future development and implications. Late last century the human race learnt how to enter cyberspace. But in the 2020s the reverse will happen, with computers, robots and AI set to transform the physical world. Soon driverless vehicles will rule our highways, while many products will be manufactured in ‘dark factories’ by smart machines. Some of tomorrow’s most sophisticated technologies may even be organically grown using the latest digital science of synthetic biology. 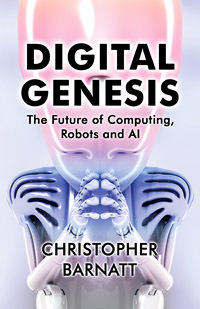 Digital Genesis is written by futurist Christopher Barnatt, who in his 1995 book Cyber Business predicted the arrival of e-business and online social networks. Over 20 years later, he looks ahead to the Cognitive Computing Age, and beyond that to the era of ‘cyborg fusion’ in which the future of computing will become the future of ourselves. £10.99 UK / €11.99 EU. 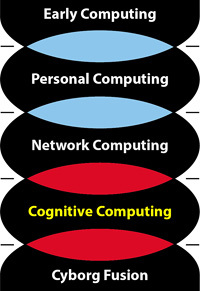 We are starting to transition to the Cognitive Computing Age in which any digital technology will be able to possess, or remotely access, some level of artificial intelligence. This page last updated 29 June 2018. Please visit our sister site at ExplainingComputers.com.